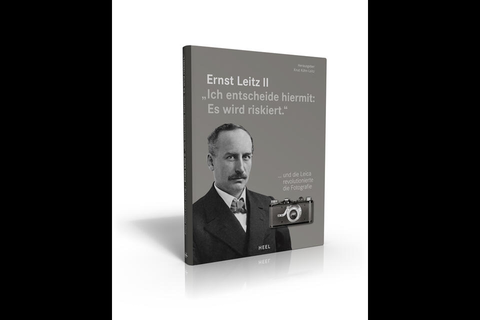 Leica Camera AG is celebrating a double anniversary in 2014: it has been 100 years since Oskar Barnack (1879–1936) completed the first model of the Leica in March 1914, and 90 years have passed since, in June 1924, Ernst Leitz II (1871–1956) made the decision to begin production of the camera with a lens designed by Max Berek. With the momentous words: ‘My decision is final. We will take the risk,’ Ernst Leitz made a groundbreaking decision that would make history as an almost impossible venture and decisively influence the photo-technical and photochemical industry segments for almost 75 years. Today, 90 years later, Knut Kühn-Leitz has published a new biography of his grandfather with contributions from numerous experts. This book, which is printed in German, rounds off the celebration of 100 years of Leica photography and will be available from book stores starting on 20 May 2014. Although Ernst Leitz had recognised the trend towards a small, light and highly portable camera quite early, he also knew that the camera alone was not enough. The industrialist and successful factory owner not only knew full well that such a camera needed to be extremely precisely engineered and required an outstanding lens, he also knew that it must be accompanied by a completely new range of equipment dedicated to the 24 × 36 mm film format – for instance, a special cassette for the film and, above all, devices such as enlargers and projectors for the reproduction of the results from the negatives, which are almost as small as a postage stamp. When the Leica was first presented to the public at the Leipzig spring fair in 1925, the Leitz programme already offered a choice of two simple enlargers for 6 × 9 cm prints and the 9 × 14 cm postcard format. Only one year later, Leitz was already offering the first enlarger for variable formats and a projector for film strips. It must be considered that the factory owner’s decision was made at a time of hyperinflation and extreme unemployment. Leitz, a manufacturer of microscopes, nevertheless decided to establish what was a completely new branch of production for his company, photographic equipment – not least for social reasons. ‘If it fulfils the promise I see in it, this little camera offers an opportunity to provide employment for our workers in the years of depression and bring them through the difficult times to come.’ A true assessment of just how far-reaching Ernst Leitz’s decision was is only possible when the important roles of the availability of recording media and the sales and distribution structures of photographic suppliers of the day are taken into account. This is also covered extensively in the first part of the book. The second part concerns itself with Ernst Leitz as a person. He was in many ways a politically engaged and socially active man and also possessed a high degree of moral courage that went hand in hand with a preparedness to bear the weight of enormous risks to himself and his family. In the difficult and dangerous years of the National Socialist regime, he helped many of his fellow citizens who were persecuted for their race or political beliefs with work and sustenance in the company or aided their flight to a company subsidiary in another country.